Certain plant growth-promoting rhizobacteria (PGPR) elicit induced systemic resistance (ISR) and plant growth promotion in the absence of physical contact with plants via volatile organic compound (VOC) emissions. In this article, we review the recent progess made by research into the interactions between PGPR VOCs and plants, focusing on VOC emission by PGPR strains in plants. Particular attention is given to the mechanisms by which these bacterial VOCs elicit ISR. We provide an overview of recent progress in the elucidation of PGPR VOC interactions from studies utilizing transcriptome, metabolome, and proteome analyses. By monitoring defense gene expression patterns, performing 2-dimensional electrophoresis, and studying defense signaling null mutants, salicylic acid and ethylene have been found to be key players in plant signaling pathways involved in the ISR response. Bacterial VOCs also confer induced systemic tolerance to abiotic stresses, such as drought and heavy metals. A review of current analytical approaches for PGPR volatile profiling is also provided with needed future developments emphasized. To assess potential utilization of PGPR VOCs for crop plants, volatile suspensions have been applied to pepper and cucumber roots and found to be effective at protecting plants against plant pathogens and insect pests in the field. Taken together, these studies provide further insight into the biological and ecological potential of PGPR VOCs for enhancing plant self-immunity and/or adaptation to biotic and abiotic stresses in modern agriculture. Plants and microorganisms abound with natural chemicals, many of which are volatiles. These molecules are chemically diverse, representing fatty acid derivatives, terpenes, indoles, and molecules from other chemical families (Paré and Tumlinson 1999). Among these compounds, ethylene (ET, C2H4), a potent activator of plant defense responses, was the first gaseous hormone discovered in nature (Bleeker and Kende 2000). New, fundamental insights also have emerged from examining other plant volatiles that can act as signaling entities in plants and microorganisms. 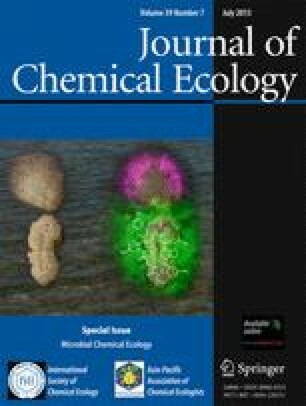 The airborne natural product derivative methyl jasmonate (MeJA), which is released from plant tissues upon exposure to insect or mechanical damage, triggers proteinase inhibitor and polyphenol oxidase induction in undamaged tomatoes or in neighboring plants (Lycopersicon esculentum; Fidantsef et al. 1999) and induces phytoalexin accumulation in bean and barley (Hordeum vulgare; Croft et al. 1993; Weidhase et al. 1987). Other examples of plant volatile chemicals that trigger plant defense responses include the induction of defense-related gene expression by methyl salicylate (MeSA) in tobacco (Nicotiana tabacum; Shulaev et al. 1997). When certain C6 components produced from a branch of the lipoxygenase (LOX) pathway (Hatanaka et al. 1987) are released, these compounds can reduce herbivore infestation (Hildebrand et al. 1993), seed germination frequency (Gardener et al. 1990), and phytoalexin induction in nearby plants (Zeringue 1992). Molecular data have demonstrated that aerial treatment of Arabidopsis and lima bean with the synthetic C6-volatile (E)-2-hexenal induces the transcription of defense-related genes (Arimura et al. 2000; Bate and Rothstein 1998). However, while bacterial volatile determinants are known to also trigger secondary responses in planta, little is known about their role in regulating plant growth and/or defense responses. The observation that volatile emissions from bacteria can interact with plants has only recently been reported. In 2003, Ryu et al. discovered that a blend of airborne chemicals released from specific bacterial strains of plant growth-promoting rhizobacteria (PGPR) can promote the growth of Arabidopsis thaliana seedlings. PGPR include a wide range of root-colonizing bacteria with the capacity to enhance plant growth by increasing seed emergence, plant weight, and crop yields (Kloepper 1992). Seed or seedling treatment with PGPR has been used to increase the growth of several crops (Glick 1995) and to suppress the growth of plant pathogens and deleterious rhizosphere microorganisms. In addition to positively affecting plant growth, the application of certain PGPR strains to seeds or seedlings leads to a state of induced systemic resistance (ISR) that is a type of induced resistance elicited by PGPR. In contrast, pathogen- or chemical trigger-mediated induced resistance is often referred to as systemic acquired resistance (SAR) (Kloepper et al. 1999; Pieterse et al. 2002; 2009). ISR has been triggered in several crops against fungal, bacterial, and viral pathogens under both greenhouse and/or field conditions (Kloepper et al. 1999, 2004; Liu et al. 1995; Murphy et al. 2003; Ryu et al. 2004a, b, c; Zehnder et al. 1999). Recently, several genera of PGPR strains also were found to promote plant growth and elicit ISR via bacterial volatile emissions under in vitro conditions (Ryu et al. 2003, 2004a, b, c). The current review focuses primarily on the role of volatiles produced by the Gram positive PGPR strains: Bacillus subtilis GB03, Bacillus amyloliquefaciens IN937a, and Paenibacillus polymyxa E681 and one Gram negative strain Pseudomonas chlororaphis O6 in inducing plant immune responses. Few previous reports have focused on Gram positive bacterial VOC-elicited plant immune responses. Rather, more attention has been on describing Gram negative bacterial-mediated plant growth alteration (Effmert et al. 2012; Han et al. 2006; Ryu et al. 2004a; Wenke et al. 2010). Initially, in the process of developing an assay system to assess the growth promotion capacity of rhizobacteria in vitro (Ryu et al. 2003), we found that bacterial volatiles probably are involved in plant growth promotion. An assessment of growth promotion induced by bacterial volatiles in Arabidopsis revealed that inoculation with the GB03 or IN937a strain significantly promoted the growth of Arabidopsis compared with the water control or treatment with DH5α. We assayed the level of plant growth promotion by PGPR VOCs under laboratory conditions by physically separating seedlings from PGPR on divided Petri dishes (referred to as I-plates, Fig. 1); this treatment allowed only airborne signals to be transmitted between the bacterial cultures and the seedlings (Ryu et al. 2003, 2004a). The two most abundant compounds released from cultures of strains GB03 and IN937a, albeit not from cultures of the other strains, were identified as 2,3-butanediol and its precursor 3-hydroxy-2-butanone (syn. acetoin; Fig. 2)(Ryu, et al. 2003, 2004a). The qualitative and quantitative compositions of volatile blends emitted by the growth-promoting strains differ significantly from those of the null growth-promoting bacterium DH5α (Ryu et al. 2003). Exogenous application of commercial acetoin and 2,3-butanediol result in the dose-dependent stimulation of plant growth, which simulates the effects of the volatile blend produced by the two Bacillus sp.. Volatiles released from mutant strains of B. subtilis that are genetically blocked in the production of 2,3-butanediol have no effect on plants, which confirms the role of these compounds as plant growth-promoting volatile determinants (Ryu et al. 2003). Considering that these active compounds i.e., 2,3-butanediol and acetoin were elucidated only from an in vitro setup, further experiments should be conducted in conditions that are closer to the field situation in order to confirm for an ecological relevance of growth promotion effects induced by PGPR VOCs in the rhizosphere. Other components of this complex volatile blend from B. subtilis (e.g., decane, undecane, undecane-2-one, tridecan-2-one, and tridecan-2-ol) are not active in plant growth promotion (Lee et al. 2012). Since the subject of bacterial volatile-effects on plant growth (promotion and/or inhibition) has been reviewed recently (Bailly and Weisskopf 2012), we do not discuss this topic further in the current review. Instead, we focus on the PGPR VOC-mediated increase in plant fitness against biotic and abiotic stresses. In 2004, we first reported that VOCs released from plant growth-promoting rhizobacteria (PGPR) trigger ISR in Arabidopsis (Ryu et al. 2004a; Fig. 3). As mentioned, we examined the ISR capacity in Arabidopsis by PGPR VOCs in vitro using the I-plate system (Fig. 1). We selected a nectrotrophic pathogen Pectobacterium carotovorum subsp. carotovorum (syn. Erwinia carotovora subsp. carotovora) as the pathosystem, because this pathogen can cause clearly visible soft rot symptoms in plants within 24 h, whereas it takes at least 7 day for symptoms to be evident in the Pseudomonas syringae pv. tomato–Arabidopsis system. Using this pathosystem, we were able to screen for active PGPR VOC producers that can elicit the ISR response among several bacterial strains. Arabidopsis or tobacco seedlings exposed to certain PGPR strains for more than 10 days developed significantly fewer leaf symptoms 24 h post inoculation with the soft rot-causing pathogen P. carotovorum subsp. carotovorum than seedlings exposed to other strains. The maximum level of protection resulted from treatment with strains GB03 and IN937a, whereas four other PGPR strains that cause ISR when inoculated onto crop seeds in soil failed to induce resistance in the I-plate test. These results suggest that VOC-mediated ISR elicitation is not a common mechanism among all PGPR in the rhizosphere. Which Bacterial Odor is Critical? The next logical step in this investigation was to determine which bacterial VOC(s) play critical roles in ISR. We, therefore, performed gas chromatography combined with mass spectrometry (GC/MS) analysis of the headspace VOCs collected from PGPR strains, which is similar to our previous analysis of plant growth promotion by bacterial VOCs. Analysis for 24 h revealed the consistent release of 2,3-butanediol and its precursor 3-hydroxy-2-butanone from ISR-triggering strains GB03 and IN937a, whereas these VOCs were not released from the non-ISR-activating bacterial strains DH5α and 89B61 (Ryu et al. 2004a). In fact, most bacterial species of the Proteobacteria and Firmicute groups produce 2,3-butanediol and acetoin under low-oxygen conditions, thus providing an alternative electron sink for the regeneration of NAD+ when aerobic respiration is limited (Ramos et al. 2000; Xiao and Xu 2007). Such a scenario may occur in the low-oxygen environment of the rhizosphere, where PGPR naturally reside. Analyzing the comprehensive chemical profile of PGPR volatiles further revealed that a mixture of more than 30 different volatiles are emitted from cultures of Bacillus spp., based on a more advanced headspace solid phase microextraction technique coupled with software extraction of overlapping gas chromatographic (GC)-separated components (Farag et al. 2006; Lee et al. 2012). Further studies should focus on detecting ISR-triggering molecules in this complex blend that are potentially more effective than 2,3-butanediol and acetoin. The absolute configuration of GB03-synthesized 2,3-butanediol is exclusively in the (2R, 3R)-form, as determined by chiral GC column chromatography (Ryu et al. 2004a). Comparing the bioactivity of both (2R, 3R) and (2S, 2S) stereoisomers also may help reveal whether stereoisomer specificity exists in PGPR volatiles and whether this specificity is responsible for ISR induction and/or growth promotion in planta. Structural specificity of insect-derived elicitors is evident in the herbivore elicitor volicitin; the L-isomer of this compound is active in VOC emissions, whereas the D-isomer is inactive (Truitt et al. 2004). Pharmaceutical application of synthetic 2,3-butanediol at different doses and a volatile extract collected from strain GB03 show similar disease-protection capacity, which is comparable to that induced by direct PGPR inoculation (Ryu et al. 2004a). Notably, doses of 0.2 pg to 0.2 μg/ml (in increments of 1:100 dilutions) trigger similar levels of ISR, whereas pre-exposure of plants to 20 μg of this compound fails to induce ISR. Recent data from another PGPR strain, P. polymyxa E681, reveal that long-chain bacterial VOCs, i.e., the C13 hydrocarbon tridecane, also can elicit ISR, as can C4 alcohols such as 2,3-butanediol (Lee et al. 2012). The genus Paenibacillus was reclassified as a separate genus from Bacillus due to its distinct biochemical and genetic characteristics (Ash et al. 1993). Nevertheless, Paenibacillus spp. from soil also has beneficial effects on several crop species (McSpadden Gardener 2004). Paenibacillus polymyxa strain E681 from barley root is a promising biocontrol agent that can protect cucumber and sesame from damping-off caused by the soilborne pathogens Fusarium oxysporum, Rhizoctonia solani, and Pythium ultimum (Ryu et al. 2005a, b, 2006). In addition to E681, which has a direct antagonistic effect on fungal growth by producing fungistatic compounds, a novel class of VOC-mediated ISR has been identified (Lee et al. 2012). In that study, ISR against the biotrophic pathogen Pseudomonas syringae was examined, as strain GB03 was previously shown to elicit ISR against a necrotrophic pathogen. What Happens in the Plant after the Bacterial “Scent” is Detected? An easy way to dissect plant signaling pathways likely to mediate for the effects of PGPR VOCs in planta is to screen defined signaling pathway mutants and transgenic plant lines following exposure to bacterial volatiles (Han et al. 2006; Ramos et al. 2000; Ryu et al. 2003). Indeed, to elucidate signaling pathway(s) that relate to ISR, a series of mutant and transgenic plant lines were exposed to PGPR VOCs found to trigger ISR through volatile emissions. ISR triggered by GB03 emissions is independent of the salicylic acid, NPR1, and jasmonic acid signaling pathways, although this response appears to be mediated via ethylene. However, ISR activation by strain IN937a is independent of all signaling pathways that were tested, which opens up the possibility that additional VOCs utilize alternative pathways in planta to trigger ISR (Ryu et al. 2004a). These results also were confirmed by using transgenic plant lines containing β-glucuronidase (GUS) fusions to PDF1.2, a gene induced by JA/ET, as well as by qRT-PCR analysis (Ryu et al. 2004a).. A recent proteomics study that employed Arabidopsis tissue exposed to GBO3 has provided a more detailed picture of how plants perceive PGPR VOCs (Kwon et al. 2010). Of the 95 spots representing proteins showing differential responses to GB03 VOC treatment (including 61 up- and 34 down-regulated proteins), 20 spots corresponded to 12 proteins involved in ethylene (ET) biosynthesis. Five representative ET biosynthesis-related genes, namely MAT3, SAM-2, ACS4, ACS12, and ACO2, were significantly up-regulated by this treatment. In addition, the ET marker genes ERF1, GST2, and CHIB were strongly induced by GB03 VOC exposure. Another proteome study that explored the effects of bacterial volatiles effect in planta confirmed that ISR elicitation against P. syringae pv. tomato DC3000 by B. subtilis FB17 is mediated via the SA and ET signaling pathways and is independent of the jasmonic acid (JA) pathway (Rudrappa et al. 2010). Bacillus subtilis C4-alcohol biosynthetic pathway mutants fail to elicit ISR, which confirms that acetoin and 2,3-butanediol serve as ISR volatile determinants. Like B. subtilis strain GB03, strain FB17 also was shown to up-regulate PDF1.2 gene transcription. However, how plants modulate and perceive PGPR VOC-elicited defense immediately after pathogen infection remains to be fully elucidated. Priming the defense pathways by external signals enables the potentiated induction of defense response without immediately activating the defense signaling cascades, which would be accompanied by the expenditure of energy for defense mobilization (Paré et al. 2005). In the case of PGPR priming of plant defenses, induction of the primed state is thought to result in an increase in the amount or activity of cellular components that play important roles in defense signaling; this process is not associated with direct changes in gene expression in leaves (Lee et al. 2012). The priming activity of 2,3-butanediol, thus reducing plant susceptibility to disease, was confirmed in a study that employed altered Bacillus spp. strains that were no longer able to produce this VOC (Ryu et al. 2004a). In a separate study, Han et al. (2006) reported that the application of 2,3-butanediol failed to elicit ISR against Pseudomonas syringae pv. tabaci but did induce the ISR response against P. carotovora subsp. carotovora, thus suggesting that different defensive cascades are elicited in response to different pathogens. Indeed, the ethylene (ET)-dependent plant defense signaling pathway is more effective against a necrotrophic pathogen such as P. carotovorrum subsp. carotovorum than against P. syringae, which requires an SA-dependent resistance response (Pieterse et al. 2009). Long-chain VOC emissions, such as tridecane, released from P. polymyxa E681 prime the transcriptional expression of the salicylic acid, jasmonic acid, and ethylene signaling marker genes PR1, ChiB, and VSP2, respectively. Comparison of the signal transduction cascades activated by individual VOCs in the presence or absence of external priming agents should provide more insight into the roles of elicitors and priming agents in triggering plant defense responses and in increasing the long-term fitness of plants (Lee et al. 2012). We hypothesize that the bacterial production of diverse VOCs may help plants modulate defense signaling pathways, including SA and ET signaling, thus protecting them from various types of pathogens, i.e., necrotrophs and biotrophs (Fig. 3). As illustrated above, certain PGPR strains can induce changes in plant physiology and signaling when potential pathogens threaten to attack the plant (Pieterse et al. 2002; van Loon et al. 1998). Recently, an increasing number of studies have demonstrated that PGPR and their products, including VOCs, trigger plant tolerance to abiotic stresses, including drought stress, salt stress, and/or nutrient deficiency (Yang et al. 2009). We previously proposed the term induced systemic tolerance (IST) for “PGPR-induced physical and chemical changes in plants that result in enhanced tolerance to abiotic stress”. Biotic stress is excluded from IST because conceptually it is a part of biological control and induced resistance. (Yang et al. 2009). The integrated regulation of orchestrated biological processes, including whole-plant auxin redistribution, leaf cell expansion, root branching, and augmented photosynthesis, underlie plant growth promotion triggered by VOCs from B. subtilis GB03 (Zhang et al. 2007, 2008a). Concomitant with the higher photosynthetic capacity in GB03 VOC-treated plant, increased iron uptake also was observed in these Arabidopsis plants (Zhang et al. 2009). Iron is a micronutrient that is essential for the photosynthetic apparatus, due to the redox potential of Fe2+/Fe3+. In soil, iron is present mainly as insoluble oxyhydroxide polymers, which are not readily taken up by plants. As a result, iron deficiency can occur, especially in plants grown in calcareous soils, which accounts for approximately one-third of the earth’s soils (Guerinot and Yi 1994). Under normal growth conditions, GB03 VOCs increase mRNA levels of the Fe-deficiency-induced transcription factor 1 (FIT1) and two of its target genes, ferric reductase FRO2 and the iron transporter gene IRT1. On the other hand, VOC-triggered enhancement of iron assimilation and photosynthetic efficiency are both compromised in the Arabidopsis fit1-2 knockout mutant, indicating that FIT1 plays a key role in mediating VOC-induced iron uptake. In addition to the transcriptional regulation of plant iron uptake genes, bacterial volatiles also produce acidification of plant growth media (Zhang et al. 2009), which increases iron mobility in plants (Marschner and Römheld 1994). In fact, rhizosphere acidification also increases the ferric reductase activity of FRO2 (Zhang and Pare, unpublished data). GB03 VOCs lead to rhizosphere acidification via two mechanisms, i.e., elevated proton exudation from roots and direct acidification by unknown VOC component(s). As rhizosphere acidification appears to be an efficient way to increase the uptake of iron (and possibly other nutrients) by plants, experiments should be performed to determine if acidic components are commonly present in volatiles of beneficial soil bacteria and whether acidification-enhanced iron uptake can also be induced by VOCs from other bacteria (Fig. 3). Arabidopsis plants exposed to GB03 VOCs are less susceptible to salt stress than control plants, as the VOC-exposed plants accumulate less Na+ in both shoots and roots (Zhang et al. 2008b). The sodium transporter AtHKT1 may function as a pivotal component in mediating VOC-induced salt tolerance. AtHKT1 functions in the removal of Na+ from xylem sap. Therefore, the presence of AtHKT1 in roots restricts the uploading of Na+ to aerial portions of the plant, whereas in shoots this protein mediates Na+ exclusion from the leaves (Horie et al. 2009; Møller et al. 2009). In addition, increasing evidence has shown that AtHKT1 confers shoot-to-root Na+ recirculation, possibly by loading Na+ into phloem vessels (Berthomieu et al. 2003; Sunarpi et al. 2005). The root-to-shoot ratio of Na+ levels in VOC-treated plants is greater than that detected in control plants, which is consistent with the canonical role of root AtHKT1 in restricting Na+ in the roots. Moreover, increasing the shoot-to-root recirculation of Na+ also can lead to a higher proportion of Na+ in the roots, with less Na+ in the shoots, as observed in VOC-treated plants. GB03 VOCs concurrently repress and increase AtHKT1 expression in roots and shoots, respectively. This mechanism affirms the role of AtHKT1 in controlling shoot-to-root Na+ recirculation and helps explain VOC-induced salt tolerance (Zhang et al. 2008b). Nonetheless, these observations indicate that other components in the Na+ homeostasis pathway also may contribute to VOC-induced salt tolerance. The calcium signaling sensor AtSOS3 is required for post-transcriptional activation of the H+/Na+ antiporter AtSOS1, which controls root Na+ exudation as well as long-distance Na+ transport within plants (Shi et al. 2000). GB03 VOCs triggers an approximately 50 % reduction in whole-plant Na+ levels in wild-type plants. By contrast, the Arabidopsis sos3 mutant exhibits a reduction in Na+ accumulation of only approximately 15 % (Zhang et al. 2008b), suggesting that AtSOS3-dependent Na+ exudation is required, at least in part, for the decreased accumulation of Na+ in VOC-treated plants. Intriguingly, VOC treatment does not reduce Na+ accumulation in the athkt1 mutant, indicating that VOC-induced plant salt tolerance is likely an outcome of the integrated regulation of Na+ homeostasis. Questions remain about the mechanisms underlying the regulation of Na+ homeostasis, including the following: 1) are abscisic acid (ABA) levels in salt-stressed plants affected by GB03 VOCs, as was observed with un-stressed plants (Zhang et al. 2008a)? 2) is the differential regulation of HKT1 gene expression in VOC-treated Arabidopsis dependent on ABI4, which is a transcriptional repressor of HKT1 (Shkolnik-Inbar et al. 2013)? and 3) do GB03 VOCs trigger post-transcriptional regulation of components in the salt stress response pathway? Another intriguing question is whether rhizosphere acidification creates a proton gradient that favors transport of H+ into roots, thereby facilitating AtSOS1-dependent Na+ exudation (Fig. 3). Arabidopsis plants grown with GB03 or another rhizobacterium, P. chlororaphis O6, in the soil exhibit increased drought tolerance (Cho et al. 2008; Zhang et al. 2010). Combined GB03 VOCs up-regulate the transcript levels of PEAMT in plants, leading to increased biosynthesis of choline and glycine betaine, two compatible solutes that protect cells from osmotic stress under dehydrating conditions. This enhanced osmo-protection is not caused by alterations in ABA production, as osmotic-stressed plants exhibit VOC-independent accumulation of ABA in both shoots and roots (Zhang et al. 2010). The active components in GB03 VOCs that confer plant stress tolerance have not yet been identified, whereas 2R,3R-butanediol has been shown to be necessary and sufficient for eliciting plant drought tolerance conferred by Pseudomonas chlororaphis O6 (Cho et al. 2008). The SA signaling pathway may be involved in P. chlororaphis O6-induced drought tolerance, as drought-stressed plants exposed to either bacterial “scent” or 2,3-butanediol accumulate higher levels of SA than untreated plants (Cho et al. 2008). Although VOC emissions from rhizobacteria such as B. subtilis GB03 have multiple beneficial effects on plants, the same blend of volatiles also may have an adverse effect on plant growth under certain circumstances. For example, it is not known whether the activation of the iron uptake pathway (Zhang et al. 2009) may result in stress phenotypes in plants grown in the presence of toxic heavy metals such as Cd, which employs the same transporter as Fe. In fact, instead of increasing the level of photosynthesis, GB03 VOCs significantly reduce chlorophyll content and photosynthetic efficiency in plants treated with 10 μM ABA (Zhang et al. 2008a). Indeed, it is unclear whether a trade-off scenario exists in plants when growth promotion is triggered by bacterial VOCs. A comprehensive review of bacterial VOCs negative impacts on plant growth has been compiled by Bailly and Weisskopf (2012). Both solid-phase microextraction (SPME) and dynamic headspace volatile analyses have revealed that active PGPR strains have the requisite machinery to synthesize a wide range of volatiles, including short-chain aliphatic aldehydes, esters, alcohols, organic acids, ethers, ketones, sulfur compounds, and hydrocarbons (Fig. 2). Among the PGPR strains that were examined, B. amyloliquefaciens IN937a produces the largest volume of VOCs, followed by B. subtilis GB03 (Farag et al. 2006). Alcohols represent the most abundant compounds consistently released from GB03 and IN937a strains, with 2,3-butanediol and 3-hydroxy-2-butanone (also referred to as acetoin) identified as bioactive molecules that trigger both growth promotion and ISR (Ryu et al. 2003, 2004a). Oxidized and methylated products of these fusel alcohols were identified in later studies, including aldehydes, ethers, and acids, all of which have yet to be tested for possible biological effects (Farag et al. 2006). In Bacillus sp., 2,3-butanediol and acetoin are products of an alternative reductive pathway originating from pyruvate. This pathway produces an alternative source of NAD+ under anaerobic conditions and is analogous to alcohol fermentation, which is activated in yeast under low atmospheric O2. By contrast, the accumulation of the branched alcohols 3-methyl-1-butanol, 2-methyl-1-butanol, and 2-methyl-1-propanol in Bacillus amyloliquefaciens IN937a headspace volatiles suggests that these compounds are formed as degradation products of the branched amino acids leucine, isoleucine, and valine, respectively, via the Ehrlich pathway, as in yeast (Dickinson et al. 1997; Marilley and Casey 2004). This pathway involves the concerted actions of a transaminase, a decarboxylase, and an alcohol dehydrogenase, as is also the case in yeast and lactic acid bacteria. Catabolic products of the sulfur-containing amino acids methionine and cysteine also were detected, as exemplified by dimethyldisulfide (DMDS) and dimethyl trisulfide (DMTS), which are found in most PGPR strains and in lactic acid bacteria (Seefeldt and Weimer 2000) and fungi. We still do not have a clear picture of the biological or ecological relevance of the latter compounds in PGPR. The biogenetic origins of many of these compounds have been determined in other organisms but not in PGPR; the in vivo functions of these branched alcohols in PGPR also have not been fully elucidated. Their origins can be unambiguously determined by feeding precursor isotopes to PGPR cultures and monitoring for label enrichment in the released volatiles. Volatile compounds can be extracted directly from bacterial culture supernatants, and their 13C enrichment levels can be obtained by GC coupled with isotope ratio mass spectrometry (IRMS) (Goupry et al. 2000). Recent data from VOCs profiling studies in P. polymyxa E681 show that the long-chain C13 bacterial volatile tridecane augments ISR by defense priming (Lee et al. 2012). To date, the microbial production of this hydrocarbon has not been studied extensively. The observed variation in volatile profiles among various PGPR strains suggests that diverse VOC metabolic mechanisms exists among PGPR, and supports the idea that VOCs can serve as taxonomic markers in PGPR, as in other microbial systems (Kim et al. 2013; Scholler et al. 2002). To further analyze differences in volatile production among strains in an untargeted manner, chemometric data analysis, as exemplified by principal component analysis (PCA), could be performed on VOC quantification data. Coupling the differential VOC profiles from different PGPR strains with the analysis of differential levels of gene transcription may be useful for probing biosynthetic pathways leading to volatile production in PGPR strains. Pharmacological doses of 2,3-butanediol and tridecane tested in (Ryu et al. 2004a) and (Lee et al. 2012), respectively, were comparable to those released from PGPR grown in vitro on Murashige-Skoog (MS) media and later from PGPR inoculated on potato root under low oxygen pressure (Farag et al. 2006), but have yet to be compared with VOCs levels produced in the soil. By growing PGPR and Arabidopsis seedlings on separate sides of divided petri dishes, only were we able to examine the role of airborne bacterial metabolites in triggering ISR. Nevertheless, we note that a possible scenario that volatiles produced from PGPR residing on the plant root can act directly and elicit an effect is supported by the detection of 2,3-butanediol from PGPR inocculated on potato root (Farag et al. 2006). Detection of these bioactive volatiles from PGPR grown on plant roots in the rhizosphere, and whether it can diffuse within soil particles at sufficient levels to elicit response in neighboring roots, is a topic that has yet to be investigated. A variety of systems have been developed to capture, analyze, identify, and quantify airborne volatiles released from plants. Methodology commonly used for airborne volatile analysis is based on headspace analysis followed by GC analysis (Fig. 4). Headspace volatiles can be extracted from a dynamic air flow over a bacterial culture onto an absorbent filter and released by rinsing the filter with organic solvent. Conversely, the volatiles can be collected in the absence of air flow by SPME and directly released into a heated GC injector. For an in depth review of volatiles collection methods (Tholl et al. 2006) should be consulted. The number of detectable volatiles in an organism blend generally increases when various techniques are applied, e.g., dynamic headspace volatile capture in open and closed airflow systems, different trapping materials, SPME, GC/MS, and proton transfer reaction/mass spectrometry (PTR-MS), as summarized in Wenke et al. (2012). Indeed, no single analytical method can accurately survey the entire volatiles profile of a living organism i.e., plants or bacteria. However, the combination of several sampling techniques is a powerful methodology for identifying of volatiles. Because of the complementary analytical features of static closed SPME volatiles sampling technique versus dynamic headspace sampling, opportunities for leveraging both methods are being considered, which could create more comprehensive volatiles profiling. In addition, concerns about chemical bias using one technique can be circumvented through a combination of both methods to help provide a more complete and accurate profile of volatiles released from a sample under investigation. Unlike airborne VOCs such as plant volatiles, which can easily be sampled by headspace collections of living plants, rhizosphere emissions by PGPR present the complication of requiring the desorption of low molecular weight compounds from the soil matrix. By growing PGPR in Petri dishes (Ryu et al. 2003, 2004a), we were able to examine and identify the role of airborne bacterial metabolites in triggering ISR and growth promotion. To date, two different types of headspace sampling techniques have been employed to investigate PGPR volatiles. The first analysis was performed using dynamic headspace sampling, in which headspace volatiles were extracted from a dynamic continuous humidified air flow over PGPR grown on solid Murashige-Skoog (MS) medium onto divinyl benzene absorbent filters (Super Q, Alltech) and then released by rinsing with methylene chloride (Ryu et al. 2003, 2004a). We determined that MS medium produces lower background signals than other media such as Luria-Bertani media (LB); the peptone in these media releases a large number of volatiles, which interferes with the analysis of volatiles derived from PGPR strains (unpublished data). Furthermore, the effects of growth media and conditions on the PGPR emission spectra have to be considered (Ryu et al. 2003, 2004a). A review by (Bailly and Weisskopf 2012) into the culture conditions for Bacillus species within PGPR revealed that promoting effects was observed when Murachige and Skoog media was used to grow the bacteria as well as the plants. Albeit, when LB [or the similar medium nutrient broth agar (NA)] were used, the volatile-mediated effect was abolished, if not an inhibitory effect observed, which reveals the major effect of media composition on PGPR released VOCs. Enrichment of C-source (i.e., sucrose) in MS medium versus nitrogen (i.e., proteins) in LB is likely to account for VOC variation. The impact of the cultivation medium on the volatiles mediated effect of bacteria on plants was also assessed by (Blom et al. 2011) using a collection of Burkholderia strains and affirming effect of media on volatiles composition and effect on plants. Results from the studies by Ryu et al. (2003, 2004a) successfully led to the identification of the two bioactive volatile chemicals, acetoin and 2,3 butanediol, from the GB03 and IN937a strains. Nevertheless, the continuous air flow over bacterial cultures in the volatile setup employed (Ryu et al. 2003, 2004a) may not closely mimic the low oxygen partial pressures usually present in the root environment where PGPR naturally reside (Kloepper et al. 1999). In addition, the low adsorption affinity of Super Q filters for low molecular weight metabolites may have reduced collection yields. To more thoroughly examine specific differences in VOC emission profiles, headspace SPME, coupled with software extraction of overlapping GC-separated components, was employed (Fig. 4). SPME can extract volatiles from bacterial cultures in a relatively short amount of time, usually <30 min in a no-flow, low oxygen environment, and has been successfully used to collect them in several systems (Goupry et al. 2000; Marilley and Casey 2004). Despite the advantages of SPME, fiber coatings need to be considered with caution, as they can limit sensitivity by preferentially absorbing or excluding particular analytes based on polarity or size. For example, PDMS fiber preferentially adsorbs non-polar metabolites, whereas divnylbenzene/carboxen/PDMS (DCP) fiber favors short-chain polar compounds (Doleschall et al. 2003; Jelen et al. 2000). In the case of PGPR volatiles, divnylbenzene/carboxen/PDMS fiber provides the best recovery of VOCs; it favors the adsorption of polar low molecular weight VOCs, which are the predominant VOCs released from PGPR strains. A total of 28 new volatile components that were not identified by dynamic headspace sampling were identified from PGPR strains (Farag et al. 2006) using SPME, with more differences in VOCs revealed among PGPR strains. The increase in the identification of VOCs was due, in part, to the increased sensitivity of the fiber towards low molecular weight volatiles. In addition, processing the MS files with AMDIS software assisted in adjacent peak deconvolution and background subtraction and increased the detection limit (Farag and Wessjohann 2012; Halket et al. 1999). Indeed, the application of metabolomic identification strategies for volatile analysis has great potential for examining PGPR, as the small molecules released from bacteria are highly polar, with a strong tendency to co-elute (Fig. 4). This factor can lead to the production of overlapping MS spectra, which hinders accurate identification of volatiles and affects peak quality matching against chemical databases (Farag and Wessjohann 2012). A variety of resources can be used to identify unknown compounds in a given volatile sample, including >600,000 compounds with known mass spectra cataloged in searchable mass spectral libraries and/or kovat index (KI) measurements. In future analyses of PGPR VOCs, perhaps in situ volatile collection methods will be developed to determine whether bioactive PGPR volatiles are released in the rhizosphere where PGPR normally reside and whether ISR and the growth promotion effect elicited by PGPR VOCs can occur in soil or soil-less medium. Measuring emissions of volatile isoprenoids from roots in vivo was made feasible under natural field conditions by using a dynamic bag enclosure method developed by (Lin et al. 2007), which could be considered for monitoring PGPR VOCs in the rhizosphere. Nevertheless the preparation method used for dynamic enclosure sampling was found to affect magnitude and composition of emissions which has to be adapted in the case of PGPR. Despite their volatile nature, VOCs may have practical applications, as many VOCs, such as 2,3-butanediol, are water soluble, inexpensive (<$1/kg), function at extremely low concentrations (at the ng–pg/ml level), and appear to be safe to animals and humans. Under growth chamber conditions, the direct application of acetoin to roots produces a significant reduction in pathogen growth at 96 hr post challenge (Rudrappa et al. 2010). Therefore, bacterial VOCs represent good candidates for improving disease control through the enhanced management of induced disease resistance. Nevertheless, the primary challenge to field application of bacteria-derived volatiles is developing adequate methods of chemical treatment. These volatiles are released at very low, steady levels from bacteria, a process that is difficult to mimic. Indeed, the application of a single, high dose of a VOC may stress a plant, as observed after the application of other volatile signaling molecules such as MeJA (Kessler and Bladwin 2001). The high vapor pressure of these short-chain volatiles, with low boiling points, also could lead to significant losses of compounds upon application. A controlled-release form of PGPR VOCs, as pioneered for the application of phytohormones (Kessler and Bladwin 2001), has yet to be developed in the case of PGPR. PGPR volatiles have other drawbacks as well, including the high evaporation rate after application in the open field, their negative effects on plant growth, and their inconsistent levels of effectiveness. Another method for applying VOCs to plants involves drench application of bacterial volatiles. This method has been successfully applied to pepper roots and seeds as well as cucumber seeds, leading to defense priming and ISR under field conditions for four consecutive years (Ryu laboratory, unpublished data). In addition, 4-week-old pepper plants were dip-treated with 1 mM 3-pentanol solution before they were transplanted to the field. This process elicited ISR in 2-year field trials without affecting fruit yield. Drench application of the volatiles 3-pentanol and 2-butanone up-regulated the defense-related gene CsLOX in cucumber, leading to a decrease in the population of the sucking insect aphid (Myzus persicae) and significantly increasing the population of its natural enemy, ladybird beetle. These results demonstrate that triggering the oxylipin pathway in response to PGPR VOCs can help recruit a natural enemy of aphids and may ultimately prevent plant disease and insect damage by eliciting induced resistance, even under open field conditions (Song and Ryu 2013). Whether PGPR volatiles function as cues that can attract natural enemies of herbivores, or whether these volatiles induce volatile emissions from plants, which has been shown to occur in several agricultural species (Arimura et al. 2000; Farag and Paré 2002), has yet to be determined. Both scenarios are supported by the fact the GB03 volatiles lead to an increase in the accumulation of essential oils and an increase in emissions in sweet basil (Banchio et al. 2009). In addition, C6-volatiles, which share structural homology with C4-alcohols released from PGPR, also trigger terpene emission, which is similar to the effects of herbivore damage (Farag and Paré 2002). The treatment of (aerial parts of) plants with highly active but inexpensive compounds, such as 2,3-butanediol, for growth promotion, ISR induction, drought tolerance, and salinity tolerance represents a novel, promising agricultural strategy. The Petri dish assays that were employed by Ryu et al. (2003, 2004a) exposed whole plants to plumes of bacterial VOCs. Therefore, it is unknown whether the site of VOC perception for soil-grown plants is above or below ground. The sphere of microbial emissions for rhizosphere bacteria may be within the soil and/or above ground; the possibility exists that VOCs are produced at a sufficient level for aerial tissues to perceive and respond to these substances. An alternative scheme is that an endogenous signal or signals transport information from the root zone to the aerial portion of the plant. The observation that induced resistance is systemic (Pieterse et al. 2009; van Loon et al. 1998) necessitates the presence of some mobile messenger within the plant. In addition, a detailed dissection of bacterial VOC-mediated ISR will be required to understand how plant immune responses are elicited. In particular, the plant defense-boosting system referred to as “defense priming” is an important topic to consider (Conrath et al. 2002). As is the case for volatiles released and acting above ground on leaves, nothing is known about the site or mechanism of volatile perception. The critical link in establishing the biological significance of PGPR volatiles in triggering plant growth promotion and defense responses is to ascertain whether these components function in the root, where PGPR naturally resides, or whether volatiles are in fact translocated from the root to the shoot in situ. Indeed, it is not yet known whether C4- alcohols such as 2,3-butanediol serve as mobile chemical messengers to trigger responses in other plant portions, or if another mobile signal serves as a chemical messenger. Structurally related, C6-alcohols released in response to insect damage induce systemin (mobile defense polypeptide) production in addition to triggering a systemic indirect defense response in tomato (Farag and Paré 2002; Sivasankar et al. 2000). A similar scenario also may occur in PGPR VOC–plant interactions. Tracking radiolabeled, synthetic 2,3-butanediol applied to the root in other aerial parts of plants may affirm whether this molecule serves as the mobile signal in plants or whether it triggers another mobile signaling cascade. How plants perceive and respond to PGPR may be clarified by using large scale analysis techniques that screen plant mutants, and by monitoring transcriptional/proteomic/metabolomic changes in response to individual VOC treatments. Analyzing biological structure-activity relationships between natural and synthetic C4 alcohols also may help identify more biologically active volatiles and reveal crucial structural motifs in PGPR VOCs that promote growth and/or induce ISR in planta. Structure-activity relationships have been observed among C6-volatiles in triggering defense gene induction in maize (Farag et al. 2005). Another important structural motif for C4-volatile elicitation that needs to be examined is the four-carbon chain length, including whether a reduction or extension of the original C4-unit can deactivate 2,3-butanediol or acetoin, rendering these molecules unable to trigger ISR or promote plant growth. This study was supported by grants from the Industrial Source Technology Development Program of the Ministry of Knowledge Economy (10035386) of Korea, the Next-Generation BioGreen 21 Program (SSAC grant #PJ009524), Rural Development Administration, , and the KRIBB Initiative Program, South Korea, for Dr. Choong-Min Ryu, and The Alexander von Humboldt Foundation, Germany for Dr. Mohamed A. Farag.